Congrats to the winners whoever they are lol Usernames aren't up atm. Luke any news on the other competition with the signed posters? It's been over a month since the competition ended lol. 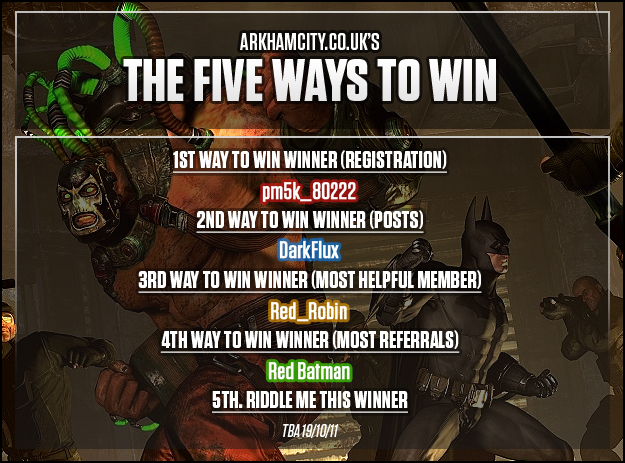 Rocksteady gotten back to you with the winners? Thanks for the awesome sig TheJester! Congraulations to everyone who wins tomorrow. Who do you think is the most helpful member? I'm guessing either Hayley or GDB. I hope I win, too. I can't believe TBA won all 5 copies! Elliott wrote: I can't believe TBA won all 5 copies! You just owned the thread. The Green One wrote: Who do you think is the most helpful member? I would give it to Red Robin but he's a mod now so i don't think he'll be able to win. Oh this means tommorrow I need to be ready to start riddle me this round 3! Bring it people! Does this mean that Round 3 of Riddle Me This will be tomorrow? What time will it be 'cos I'll be at school during the day. But yeah, can't wait to see who wins, good luck everyone! I wouldn't be so sure. It only takes one post to be able to win the copy of the game. Congrats to everyone who will win it It will be very nice to the winner for the most helpful, it would be a lovely surprise! I hope the Riddler round 3 is after school, I really do. Can't wait to see who wins. I'm curious who's going to be the most helpful user? Cool, good luck to all and congrats to the winners. That's not fair Elliot! Someone must've rigged the results!